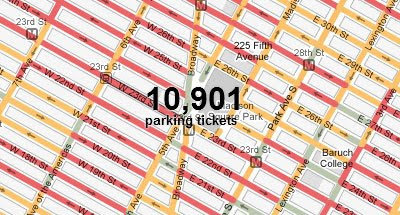 Apparently New York City issued nearly 10 million parking tickets from July 2007 to June 2008 and The New York Times has all 10 million mapped. This heat map is a great visual aid to determine the streets and blocks that have been most ticketed. The streets marked in red have seen over 2000 parking tickets issued in one year. Some of the worst hit areas include Madison Square Park, Brooklyn Heights and Staten Island Univ. Hospital. I guess it's cheaper to limp to the hospital than drive.